Baltimore police have announced they will take on the criminal investigation related to a video showing a school police officer hitting and kicking a young man inside a city school. City police will handle the investigation at the request of school police acting chief Akil Hamm, city police spokesman T. J. Smith said in a Wednesday statement. The two forces are separate agencies. City police are also providing a liaison for the school police department's internal investigation, Smith said. Baltimore City Public Schools released a statement saying their own officials are "vigorously investigating'' the Tuesday incident at REACH Partnership School. 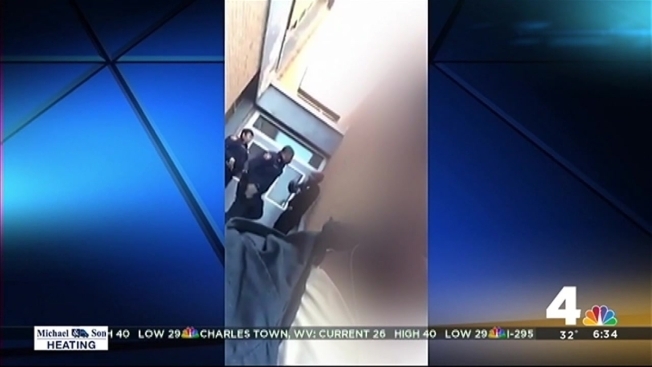 In a cellphone video shot by a student, a school police officer can be seen slapping and kicking a young man while another officer stands by. Baltimore state's attorney's office spokeswoman Rochelle Ritchie said prosecutors are working closely with the city's police department and the school police to investigate the incident. It's not clear what led up to the incident, or what happened after the camera stopped recording, but Hamm said the officers were called to the school for a report of intruders on campus. Both were on foot patrol between schools and were armed at the time of the incident, he said. Hamm also said the male was not a student at REACH. But Lauren Geisser, an attorney for him, says he is a 10th-grade student at the school. Geisser said the school provided a printout that listed his name on the school's roster. Another attorney at the firm, Charles Gilman, said the teen was "a little traumatized'' by the encounter.